News: Jack in the Box - Holiday Shakes are Back! 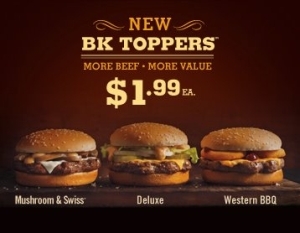 For a limited time, Burger King introduces new BK Toppers cheeseburgers. They're so-named because the burgers come in three varieties; each featuring "tasty toppings." The available varieties are: the Deluxe, Mushroom & Swiss, and Western BBQ and each BK Topper comes at a suggested retail of $1.99. The burgers also feature a noticeably thicker 3.2-ounce patty compared to the 2-ounce patty on Burger King's regular Cheeseburger. The Deluxe's toppings include American cheese, lettuce, onions, pickles, and Stacker sauce. The Mushroom & Swiss comes with mushrooms, Swiss cheese, and Griller sauce. The Western BBQ features onion rings, American cheese, and Sweet Baby Ray's Spicy BBQ sauce. You can expect these to be available until the end of the year. Looking at the ingredients, BK's Griller sauce seems to be a garlic mayo variant whereas Stacker sauce is a take on Thousand Island (aka "secret sauce"). The Western BBQ is the only one I would be interested. But I won't buy it. A Double Cheeseburger is cheaper $1.59 vs. $1.99, it has more beef 4 ounces vs. 3.2 and it has an additional slice of cheese. Meanwhile the Western BBQ includes 2-3? onion rings (none for the Double CB) and BBQ sauce instead of ketchup/mustard. It's an obvious choice for me. Even at the same price I would pick the Double Cheeseburger and enjoy more beef and more cheese. I got the Western loved the rodeo but it was the same size as a jr whopper so I don't think it was worth the price! The Western looks good, it reminds me of their slightly cheaper rodeo burger, but I can't really complain if the beef patty is larger than usual. The deluxe also sounds alright to me. Looking forward to the reviews!